Jack is a writer of narrative songs, many of these come from his own perspective, but he's also very good in separating himself from events, real and imagined and finding a way of telling them through someone else's perspective, always the mark of a fine songwriter. Jack Omer's music is like discovering a rich seam - it shines with authenticity. He is an artist who combines intensely moving lyric-writing with musical settings that have a memorable, inspired simplicity. That simplicity is the hardest thing to find in music - and Jack has it in abundance. 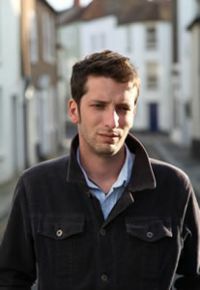 Jack Omer was born in1984, in Stevenage, England, the first-established of the post-WW2 'New Towns' (and inspiration for such new songs as The Golden Shore). ”As a child” he recalls ”I played the violin (extremely badly and without diligence or passion!) I began playing guitar around the age of 11 and did very little else for the next ten years! Playing the piano started in my late teens, in a primitive Thom-Yorke-pedal-reliant way that has continued ever since. ”My musical taste and style comes, I think, from two main sources dating from a young age. I was surrounded by the music loved by my dad whenever we spent time together. It was as a child that I discovered, through him, Bruce Springsteen, Bob Dylan, Van Morrison, Shane MacGowan and many others. Meanwhile, my step-father introduced me to the traditional folk music of the Ireland native to his parents and family; singers like Luke Kelly, Christy Moore, Ronnie Drew, Paddy Reilly, Jim McCann, Phil Coulter. I lost touch with both these strains of influence as a teenager, when I was into the faddish kind of indie-rock popular at the time, but rediscovered them at about 18, since when they've been an indispensable part of my life.